Sony VTC5 Battery 18650-3000mAh The newest Sony VTC6 18650 3000mAh 15A rechargeable Battery is perfect to use in VV/VW Mods and other high power configurations. It features a 3000mAh capacity. Specifications Model: US18650VTC6 Size: 18650 ..
eCig Battery 18350 HQ eCig Battery 18350 3.7V 18350 900mAh flat ICR HQ in grey colour ..
LG HG2 18650 Battery 3000mAh 20A LG HE2 18650 batteries are 18mm batteries designed to fit 22-23mm tube mods and most 18650 box mods. 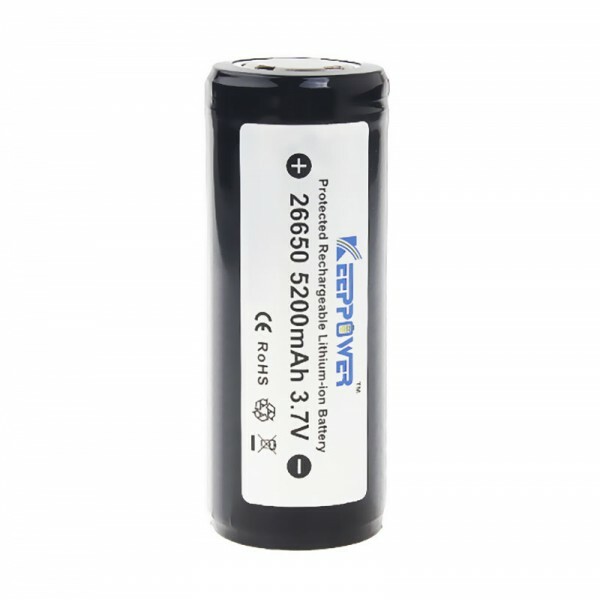 These batteries have a high capacity of 2500mAh and can support a maximum load of 20A, making them perfect for lo..
LiitoKala Lii-50A 26650 Battery Main Features: ● Long life expectancy, recharge times up to 500 times ● This high-quality product undergoes strict testing to ensure use safety ● Applicable types: flashlight, mobile power, backup power, mobile..
Model: INR21700-40T Size: 21700 Style: Flat Top Nominal Capacity: 4000mAh Continuous Discharge Rating: 30A Nominal Voltage: 3.6v Protected: No Rechargeable: Yes Approximate Dimensions: 21.1mm x 70.4mm Approximate Weight: 66.8g Note: ..
Model: INR21700-50E ● Nominal Capacity: 5000mAh ● Minimum Capacity: 4900mAh - Charge : 0.5C(2450mA), 4.2V, 0.02C(98mA) cutoff @ RT - Discharge : 0.2C(980mA), 2.5V cutoff @ RT * 1C=4900mA ● Nominal Voltage: 3.6V ● Charging Metho..
Sanyo Battery 16650 2100mAh for Joyetech eMode. Diameter: 16.35mm Length: 64.8mm Nominal Capacity: 2100mAh Nominal Voltage: 3.70V Charging Voltage: 4.3V Weight : 38g ..
Sanyo Battery 18500 ICR flat or pin head. ..
Trustfire 3.7V 10440 600mAh battery Trustfire 3.7V 10440 600mAh rechargeable battery cell is more than enough to run almost any high drain (high discharge current) electronic device. DESCRIPTION Rechargeable 10440 It has no memory effect S.. Size: 18650 Type: Li-Ni (High Drain) Nominal Capacity: 2600mAh Rated Capacity: 2600mAh Nominal Voltage: 3.7V Maximum Voltage: 4.2V Dimensions: 18.2mm x 64.9mm Rechargable: Yes Discharge Current: 35A Style: Flat Top Note: Rechargeable bat..
Efest IMR 20700 3100mAh 30A Battery The Efest 20700 3100 mah battery is a high capacity battery with 30A discharge current. It has a voltage of 3.7 volts and is certified with UL, RoHs, CE and MSDS. Its special design with multiple levels of prote..
Efest IMR 21700 3700mAh 35A Battery The Efest 21700 3700 mah battery is a high capacity battery with 35A discharge current. It has a voltage of 3.7 volts and is certified with UL, RoHs, CE and MSDS. Its special design with multiple levels of prote..
GeekVape IMR 26650 4300mah Golisi 26650 is a high performance 4300mAh rechargeable lithium battery with 35A high continuous current applications. The IMR 26650 battery can be recharged for more than 500 times and is enough to run various high drai..
MXJO IMR 26650 3500mah MXJO IMR 26650 3500mah Battery, a high performance rechargeable lithium battery, with 35A continuous discharge current and 60A peak discharge current, enough to run any high drain device. Application: Electronic Cigarette, ..